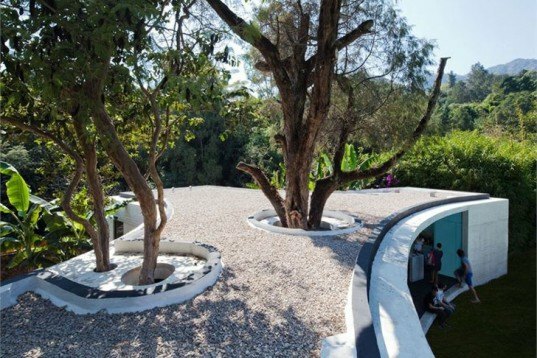 Situated amidst the luscious rocky cliffs to the south of Mexico City there is a curvaceous modern shelter designed by architects Cadaval & Solá-Morales. 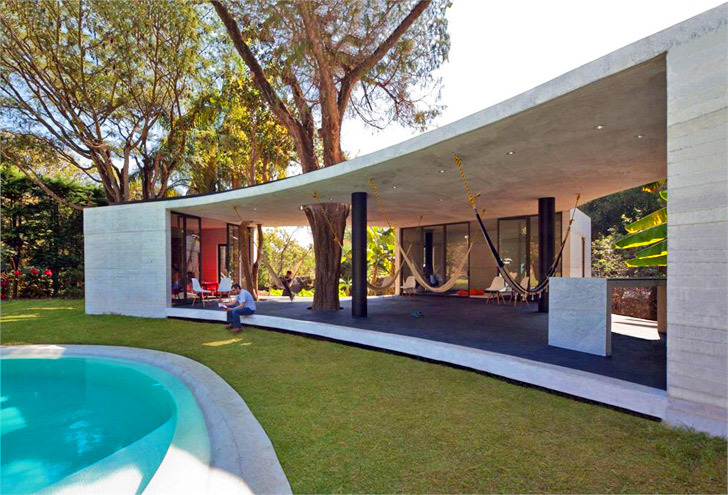 Called Tepoztlan Lounge, it offers visitors a great open space for living and lounging surrounded by wild vegetation. But the home's most striking detail is the way it incorporates native trees, which grow from the ground straight up through the ceiling! Tepoztlan Lounge an ideal space to spend long summer days, as it’s open, breezy and it hugs a nice round pool. It was designed to provide shade and shelter in hot weather, adapting gracefully to the existing vegetation while allowing it to unfold. The home is shaped like a three-point star to create separate living spaces at the end of each leg, while its center is used for communal space. An open bar with a kitchenette, a restroom, a dressing room, a play area for children and an open plan living area are all part of this beautiful house. Cadaval & Solá-Morales aimed to provide a perfect place to live and lounge, and the result is a fresh modern house. When looking from afar, is lovely to see a building designed in scale with its natural surroundings. Tepoztlan Lounge an ideal space to spend long summer days, as it’s open, breezy and it hugs a nice round pool. It was designed to provide shade and shelter in hot weather, adapting gracefully to the existing vegetation while allowing it to unfold. The home is shaped like a three-point star to create separate living spaces at the end of each leg, while its center is used for communal space. An open bar with a kitchenette, a restroom, a dressing room, a play area for children and an open plan living area are all part of this beautiful house. Cadaval & Solá-Morales aimed to provide a perfect place to live and lounge, and the result is a fresh modern house. When looking from afar, is lovely to see a building designed in scale with its natural surroundings.